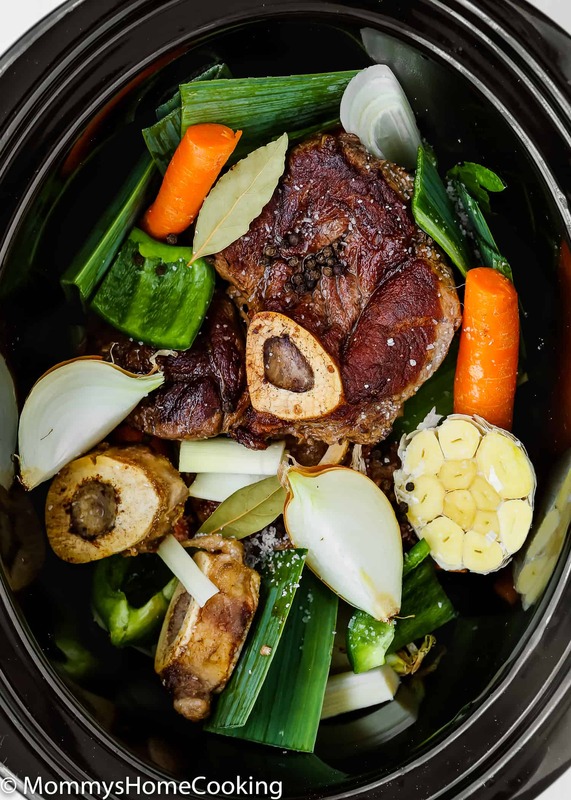 This Slow Cooker Beef Bone Broth is rich in nutrients and super tasty! It’s easy to make and it’s a money saver, too. Enjoy it on its own or use it to make your favorite stew, soup, and many other dishes. 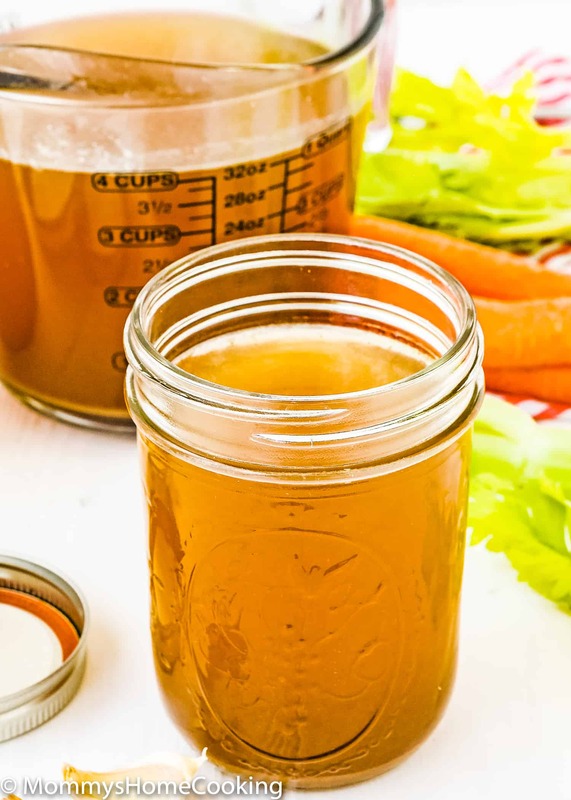 This Beef Bone Broth recipe has been in my family for many years! And today I am sharing my family recipe with my personal twist: Slow Cooker Beef Bone Broth! My grandma used to make bone broth all the time and she used it to “cure” many ailments, such hangover, joint pain, lovesickness, PMS, cold/flu, stomach discomfort, and more. In her opinion, the bone broth was the panacea for all life difficulties. And I agree. I do not know the science behind this bone broth, what I do know is that when you drink a cup of it, you feel like your soul rises up. So, I decided to make a big batch and store it to use when needed it. Especially because lately my husband has been suffering from joint pains and I know that this is going to do wonders. You can make bone broth with beef bones, pork bones, chicken bones, or a mix of all of them. Roast or sear all the bones and cut all the vegetables. Cook over the stove, slow cooker, or pressure cooker. Let it cool. Skim off any foam or fat from the surface and store as need it. WHAT ARE THE BEST BONES TO MAKE BONE BROTH? You can use any mix of beef, pork, or chicken bones for making bone broth. It’s recommendable to use some bones with marrow since its high content of vitamins, minerals, essential fatty acids, and lipids. 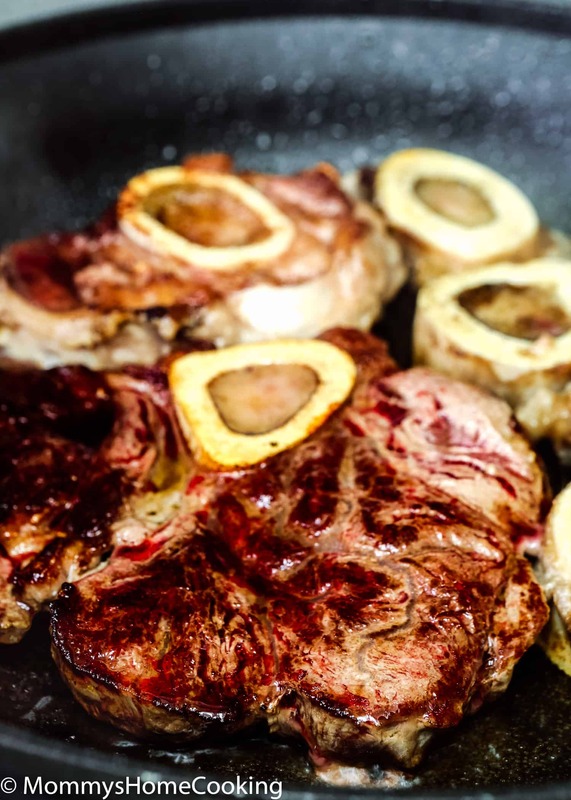 Adding some meaty bones, such shank or oxtail will make a richer-tasting broth. 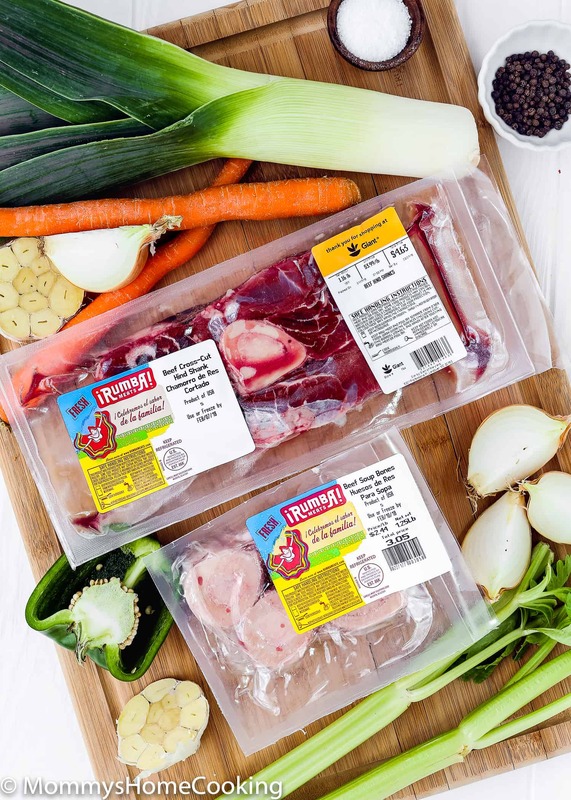 Rumba Meats offers a wide variety of cuts to make this bone broth! They all come conveniently packed to ensure freshness. I bought the beef hind shank and marrow bones in my local Giant store. If you don’t have a Giant store close by, make sure to check the store locator to find a retailer near you. My way of cooking the broth is different from my grandmother’s. She cooked it all day long in a wood stove. I, on the other hand, decided to cook it in the slow cooker, so I can set it, forget it and continue with the rest of my activities. HOW DO YOU MAKE BONE BROTH IN A SLOW COOKER? Roast or sear all the bones and cut all the vegetables. Place all the ingredients in the slow cooker and cover with a few inches of water. Cook on LOW for 12 to 24 hours. Let it cool. Skim off any foam or fat from the surface and store as need it. 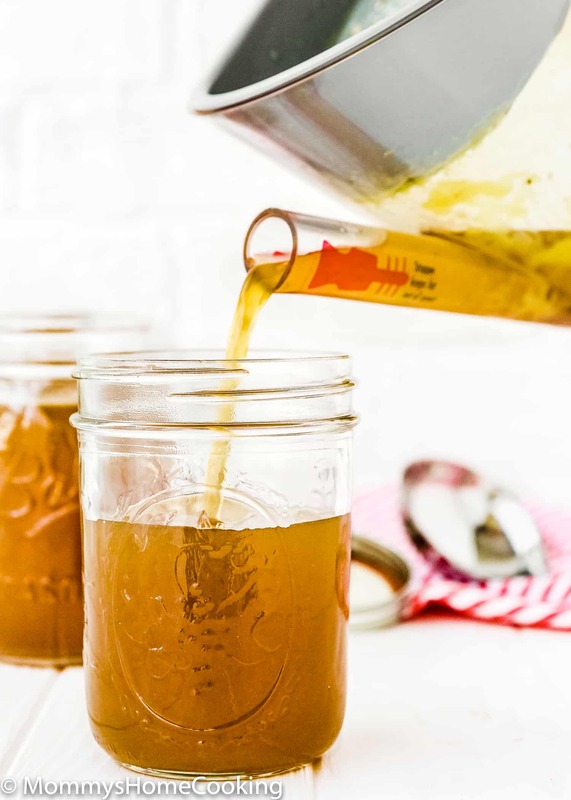 HOW DO YOU MAKE BONE BROTH IN A PRESSURE COOKER? Roast or sear all the bones and cut all the vegetables. Place all the ingredients in the pressure cooker and cover with a few inches of water. Cook on HIGH pressure for 60 to 80 minutes then release the pressure naturally, 10 to 15 minutes. Let it cool. Skim off any foam or fat from the surface and store as need it. HOW CAN YOU USE HOMEMADE BROTH? It’s fantastic on its own, but you can also use it to make pho or ramen, to make your favorite soup and/or stew, Bolognese sauce, or French onion soup. When you make this recipe, be sure to snap a photo and hashtag it #MommysHomeCooking and #RumbaMeats. I’d love to see what you cook! Heat the oil in a large skillet over medium-high heat. Season hind shank and marrow bones with kosher salt and freshly ground black pepper. Brown in the skillet on all sides then transfer to the slow cooker. Note: If your slow cooker has "sauté" mode (like the Instant Pot has) you can do this directly in the slow cooker. You can also roast the meat and bones in the oven at 425º for 25-30 minutes. Add carrots, onion, green pepper, celery, leek, bay leaves, beef bouillon (if using), peppercorns and salt to the slow cooker. Add enough water to ensure bones and vegetables are fully submerged. Cook on LOW for at least 8 but up to 24 hours. The longer you cook it, the better your broth will be. When the cooking process is over let cool slightly. Strain broth using a fine-mesh sieve and discard bones and vegetables. Taste and adjust the amount of salt if necessary. Let continue to cool until barely warm. Remove solidified fat from the top if necessary. Refrigerate for up to 5 days or freeze for up to 6 months. If storing, divide the broth to your convenience. You can store the broth in freezer-safe small containers, freezer bags or even ice cube trays. Place the lid on, and seal, and set to manual high pressure for 60 minutes. When the time is over, let the pressure release on its own. Then, carefully turn the valve to "Venting," to release any extra pressure that might still be in there. Then remove the lid. Let cool slightly. Strain broth using a fine-mesh sieve and discard bones and vegetables. Taste and adjust the amount of salt if necessary. If you decide not to add the beef bouillon add 2 tablespoons of salt instead of 1/2 tablespoon. You can also add 2 tablespoons of soy sauce or coconut aminos and 1 cup roughly chopped mushrooms to help to create a richer flavor. You can skip browning the meat/bones but doing this extra step really enhances the flavor of the broth. Adding vinegar to the broth helps to draw minerals out of the bones. I sometimes add it and sometimes I don't (my grandma never did) so it's totally up to you.